A blood test may be able to save lives by finding cancers that have started to grow again after treatment, a study suggests. 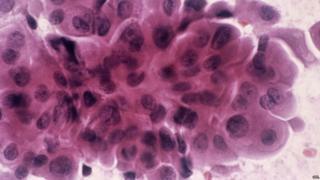 Scientists at the Institute of Cancer Research in London found traces of breast cancer eight months before doctors would normally have noticed. In the trial, the test found 12 cancers out of the 15 women who relapsed. Experts said there was still some way to go before there was a test that could be used in hospitals. Surgery to remove a tumour is one of the core treatments for cancer. However, a tumour starts from a single cancerous cell. If parts of the tumour have already spread to another part of the body or the surgeon did not remove it all then the cancer can return. Fifty-five patients who were at high risk of relapse because of the size of the tumour were followed in the study published in Science Translational Medicine. The scientists analysed the mutated DNA of the tumour and then continued to search the blood for those mutations. Fifteen patients relapsed and the blood test gave advanced warning of 12 of them. The other three patients all had cancers that had spread to the brain where the protective blood-brain barrier could have stopped the fragments of the cancer entering the bloodstream. The test detected cancerous DNA in one patient who has not relapsed. None of the women in the study were told that cancerous material had been detected as it would have been unethical to base decisions on such an unproven prototype. But the hope is that detecting cancer earlier means treatments including chemotherapy can start sooner and improve the odds of survival. Dr Nicholas Turner, one of the researchers, told the BBC News website: "The key question is are we identifying that these women are at risk of relapse early enough that we could give treatments that could prevent the relapse? "That is unknown from this research and we hope to address it in future studies. "[But] we're really talking about a principle that could potentially be applied to any cancer that has gone through initial treatment for which there's a risk of relapse in the future." The analysis of the blood is relatively cheap. However, investigating the DNA of the tumour for mutations in the first place is still expensive. The price is coming down as the field of cancer medicine moves from treating tumours in whichever part of the body they are discovered, towards drugs that target specific mutations in tumours. Dr Nick Peel, from Cancer Research UK, said: "Finding less invasive ways of diagnosing and monitoring cancer is really important and blood samples have emerged as one possible way of gathering crucial information about a patient's disease by fishing for fragments of tumour DNA or rogue cancer cells released into their bloodstream. "But there is some way to go before this could be developed into a test that doctors could use routinely, and doing so is never simple."